There is choreographed language, and threaded history, and theatre emerging from historical events happening at Ensemble Studio Theatre. Human-sized stories and delicious theatre based on the race to map and model DNA, the secret of life, the double helix inform Photograph 51, a new play by Anna Ziegler. Set in England between London and Oxford, in the years between 1951 and 1953, Ziegler has crafted a story out of the basic timelines, events, and characters in a race to see the unseeable. Hardly a boring scientific presentation, this is human drama in lab coats and English accents, with a hint of These Shining Lives (dangers of materials used in labs, see Melanie Marnich‘s fabulous treatment of the Radium Dial girls and a little review essay I wrote about it http://wp.me/pHkrs-se), a little romance, and a lot of academic competitiveness. the actual photograph 51 at the core of the issue. Rosalind Franklin (Kristen Bush) joins the lab of Maurice Wilkins (Kevin Collins) to photograph microscopic worlds. 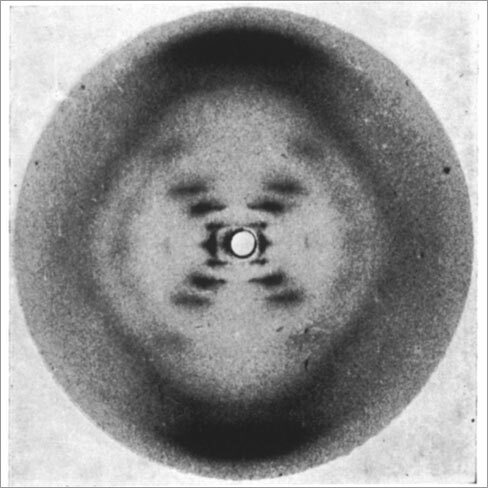 In 1951, DNA, the building block of life, was yet to be imagined in shape and chemical composition. Dr. Franklin assembles her facts methodically rather than dreaming possibilities that are then tested. This is a frame for her scientific process and this playwright’s commentary on her personal and romantic life. Might she have taken a chance for romance with visiting American scientist and changed her life? Did her methodical scientific method of taking and testing photographs lose her the scientific renown that her colleagues (and competitors) James Watson (Haskell King) and Francis Crick (Jeremy Webb) earned by taking the shape suggested by the image in “photograph 51” and crafting a model of the DNA molecule that features the otherwise never before seen double helix structure? Was Dr. Franklin exposed to dangerous substances that cause or contributed to the ovarian cancer that killed her in her late 30s? The playwright interweaves these themes and Dr. Franklin’s romantic life (quietly pursued by Dr. Caspar and Dr. Wilkins) with aplomb and grace. The chemistry among the performers in this ensemble is sweet and gentle. The direction by Linsay Firman choreographs the script’s story telling that combines letter reading and time shifting from real-time portrayal of events over a two-year period to future recollections into a largely seamless and delightful whole. All this said, there are several moments in this production that took me out of the story. First, a simile in dialogue might present an oxymoron, as one scientist described the DNA structure: like two mall escalators going in different directions. In the early 1950s at the time of this dialogue, shopping malls of multiple stories did not exist in any quantity (or at all). Escalators in train stations did exist — which might offer an alternative phrase for the playwright. Second, the pacing of the direction might benefit from a touch of variation. While speeches and movement interweave and dance with elegance and grace in the play, the pacing hardly varies, which grows a bit wearying. Finally, the shift at the play’s end from Dr. Franklin’s solid focus on her career and the clarity of her scientific methods to what appears to be sorrow at her missed romantic opportunities rang a bit false. If the Watson-Crick DNA model set piece we’ve seen assembled in prior scenes were illuminated during her final speeches with her colleague Dr. Wilkins (it was in darkness during the performance I attended), some balance might be achieved. Photograph 51 is about an image, and imagination, and dreams, and approaches to creation (faith versus assembly of facts). People making sense of a world beyond their dreams. A sweet delight.